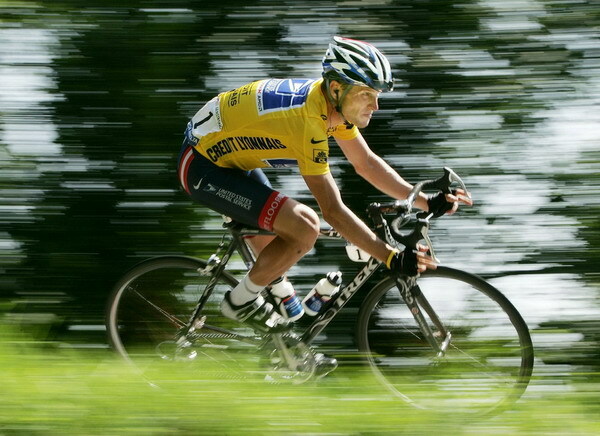 Overall leader and 7-time Tour de France winner US Postal rider Lance Armstrong cycles down a mountain during the 204.5 km long 17th stage of the Tour de France from Bourg-d’Oisans to Le Grand Bornand, in this July 22, 2004 file photo. Lance Armstrong is retiring again – this time for good. Almost a month after finishing 65th in his last competitive race in Australia, and nearly six years removed from the last of an unprecedented seven straight Tour de France titles, the 39-year-old cyclist made clear there is no reset button this time. "Never say never," Armstrong laughed at the start of an exclusive interview Tuesday with The Associated Press, then quickly added, "Just kidding." His retirement ends a comeback effort that failed to produce an eighth title or diminish talk that performance-enhancing drugs helped his career. The timing has as much to do with his growing responsibilities and family as it does with the physical limitations time has imposed. He’s tired, and tired of being hounded. Armstrong will miss competing- let alone dominating a sport like none before him- but not the 24/7/365 training regimen that made it possible. "I can’t say I have any regrets. It’s been an excellent ride. I really thought I was going to win another tour," Armstrong said about his comeback attempt in 2009, four years after his first retirement. "Then I lined up like everybody else and wound up third. "I have no regrets about last year, either," he added, despite finishing 23rd. "The crashes, the problems with the bike – those were things that were beyond my control." Armstrong spoke to the AP in a telephone interview and in a videotaped interview from his office in Austin, Texas. Armstrong zoomed out of relative obscurity after a life-threatening bout with testicular cancer to win his first tour in 1999, then set about recalibrating both the popularity of his sport and how much influence athletes can wield as advocates for a cause – in his case, on behalf of cancer survivors and researchers worldwide. International Cycling Union President Pat McQuaid had high praise for Armstrong. "His contribution to cycling has been enormous, from both the sporting point of view and his personality. All sports need global icons and he has become a global icon for cycling," said McQuaid, speaking to The Associated Press by telephone from the Tour of Oman. "The sport of cycling has a lot to be thankful for because of Lance Armstrong." Along the way, Armstrong also became one of the most controversial figures in the evolving battle against doping in sports. He claims to be the most-tested athlete on the planet during his career. Armstrong came back clean every time, and vehemently denies ever using performance-enhancing drugs. Even so, he remains shadowed by a federal investigation into the sport launched last year following accusations by former teammate and disgraced 2006 Tour champion Floyd Landis that Armstrong used drugs and taught other riders how to beat testing. Though the probe is continuing, lawyers familiar with the case told the AP recently that any possible indictments are a long way off. "I can’t control what goes on in regards to the investigation. That’s why I hire people to help me with that. I try not to let it bother me and just keep rolling right along. I know what I know," Armstrong said. "I know what I do and I know what I did. That’s not going to change." What won’t change, either, is his tenacious campaigning to raise funds and awareness in the fight against a disease his doctors once believed would keep Armstrong from competing at anything more strenuous than gin rummy. That was 1996. A year later, he set up the Livestrong Foundation and raised $10,000. In the intervening years, Armstrong used his story, his celebrity and hard work to sell millions of those ubiquitous plastic yellow wrist bracelets and enlist lawmakers in Texas and global policymakers on the scale of Bill Clinton in the cause. By the end of last year, despite tough economic times, the foundation had raised nearly $400 million total. But the real heavy lifting may just be beginning. After lobbying successfully for a Texas state constitutional amendment to provide $3 billion for cancer research over a 10-year period, Armstrong now has his sights set on California. This summer, he’ll work with legislators there to draw up and put on the ballot a measure mandating a cigarette tax with the proceeds to fund further research. Come September, Armstrong will also plead his case before a United Nations General Assembly special session on non-communicable diseases that he provided much of the impetus for. "We knew we’d be able to have some impact, but we didn’t know we’d pick up so much momentum," he said. That’s how Armstrong broke through nearly every barrier the sport had erected over a century and more- by leading with his chin. He spilled blood on the roads, came back from crashes and more than once, crossed the finish line of a stage race draped over his handlebars like a man hanging on for life instead of an unbreakable machine. One thing that never changed, though, was how Armstrong’s withering gaze controlled the pack of riders around him. He doled out favors, like stage wins, or withheld them as the mood struck him. He could command the peloton to speed up to chase a breakaway rider or slow down with an ease the old-time cycling bosses- respectfully called patrons- would have envied. That was just one reason Armstrong leaves the sport with nearly as many enemies as friends. "A lot of that has been overanalyzed and inaccurately portrayed, but it’s part and parcel of cycling. It’s how cycling operates," Armstrong said. "There’s too much infighting, jealousy and bitterness within the sport, so everybody tries to pick apart a person or a spectacular performance. "And some of it," he added, "we bring on ourselves." Cycling made Armstrong wealthy several times over, and many of the sponsors he brought into the sport continue to use him as a pitchman. A second career in politics someday does not seem out of the question. "I don’t think so. I get asked that question a lot. It’s a job. It’s probably many times a thankless job. … If I were to run for any kind of office, it’s impossible or very difficult to run right down the middle," he said. "I would have to immediately alienate half of our constituents: ‘Wait a minute, we thought this guy was a Republican. Wait a minute, we thought he was a Democrat.’ I think the effect there would be a negative effect for the foundation. For now, absolutely not on my radar." Armstrong will be at this year’s tour, bringing the oldest of his five kids, 11-year-old Luke, back to the race this summer. He may even climb into a team car to do reconnaissance work for some of the Radio Shack riders he used to race alongside. One thing Armstrong vowed not to do was spend much time reliving his accomplishments on the bike. "In 10 years time," he said, "if I’m sitting around saying, ‘I was so strong on L’Alpe d’Huez in 2001,’ then I got a problem."